In “His Revolutionary Love” my goal is to empower girl’s with confidence that will lead them to make wise choices.One of the things that builds confidence into our girl’s lives is having a safe place to talk and hopefully that safe place will be with us! My wise friend, Mary DeMuth, also has a desire to help us to instill confidence in our kids; so I have asked her to be a special guest with us today. 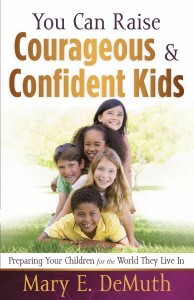 Mary has a new book out that I have been enjoying,You Can Raise Courgeous and Confident Kids: Preparing Your Children for the World They Live In. I’ve so enjoyed this book, I’m giving away a copy of it so be sure to share your comments after reading Mary’s post. I’ve parented two teen girls now, with one off to college as you read this, and the other finishing up junior high. One of the things I learned along the way is that my kids need a haven. I can’t protect them from the big, bad world. In fact, it wouldn’t be good to do so always. They need to learn to navigate the landscape beyond our front doors so that when they sprout wings (like my eldest daughter), they will know how to stand on their own. However, what has helped our kids is not our sheltering from issues, but welcoming them back home after the issues happen. It’s our job to create a home they are wildly enthusiastic about. A haven. A place to let down and be themselves. Here are ten ways you can create a haven in your home. Determine to treat your children and spouse with the same sweetness you’d give a stranger you’re trying to impress. Remember it’s God’s kindness that leads us to repentance. What makes us think anything different would evoke our children’s repentance? It’s okay to question. You did it, didn’t you? Give your children the same leeway. Let them vent. Let them worry. Welcome their wrestling. Don’t give pat answers; instead, let them work through their questions. Love them through a period of questioning. Steer your children away from mindless interaction with the TV or video games. Set limits and stick to them. Dare to believe your children are creative, innovative kids who can create instead of idly recreate. We’ve lost the importance of outdoor play. Even if it means walking to the park with your kids, or swimming alongside them, or taking a nature hike, dare to move beyond the four walls of your home to venture out to see God’s creation. 6.Weep and rejoice at the right times. We are to weep with those who weep and rejoice with those who rejoice (Romans 12:15). When a child has a difficult day, scoop her into your arms and cry alongside. When she makes a great grade, jump up and down and celebrate with ice cream. Our kids grow up so fast in this crazy culture. Keep them kids as long as you can. Let them play, run, stretch, linger. Limit activities when they’re younger so they don’t become little stressed-out adults at age ten. The most haven-producing thing I do as a mommy is simply to read to my kids. I still read to my fourteen year old! Discover books on CD as a family, lessening the tedium of car rides without popping in a DVD. My kids have stayed in the car to listen to a story finish. 9.Laugh hard, but not at another’s expense. Joking and laughter are blessings you can add to create a fun-loving haven, but be cautious not to laugh at your kids’ expense or allow them to laugh at yours or others’ expense. Watch funny, clean movies together. Tell jokes. Tell funny family stories over and over until they become ridiculous. A lighthearted family that doesn’t take itself too seriously is a haven-home. 10.Practice God’s presence in the mundane. Require chores of your kids. It teaches them important life skills. Even so, introduce joy as you work. Turn on the radio, dance, laugh. By learning to practice the presence of God during the chores of life, you create a productive, gratitude-based home. 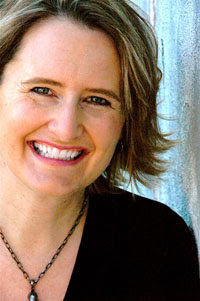 Mary DeMuth is the author of 12 books, including Building the Christian Family You Never Had, Ordinary Mom, Extraordinary God, 150 Quick Questions to Get Your Kids Talking, and You Can Raise Courageous and Confident Kids. She lives with her husband and two of her children in Texas, while one has sprouted wings to Arkansas. She loves to help readers and listeners live uncaged. Find out more at http://www.marydemuth.com, http://www.facebook.com/authormarydemuth, and @MaryDeMuth on Twitter. To be entered to win a copy of “You can Raise Courageous and Confident Kids” just answer this question: Which one of these steps of creating a haven in your home do you find the hardest? I see welcoming hard questions as the most difficult item on your list. It means we have to take a stand, but what if I give the wrong answer, what if, what if….. I have found that if I discuss my position on an issue with my child, let them know the why – hopefully share my faith based answer. They are open. I encourage them to pray about issues, I pray with and for them. I try to be open to discussing the same issue many times so that they can explore their own feelings. When the answer becomes their's, it sticks. I find that guiding them to their answer takes risks, but is well worth the effort. Answering the hard questions! Would love to read this book. Thanks for the chance to win. Getting outdoors is a tough one for us. We are homebodies at heart and find it difficult to get out and appreciate the beauty that God created, in which man had no part in. We will now work on that for balance in our family's lives. Thank you! Mine is letting kindness reign. I can let the smallest things bug me and ruin out day. Thankfulness and gratefulness open the doors for kindness! Two of these are difficult for me.. limiting media and letting kindness reign. I work outside the home and I always have visions of scooping my kids up in hugs when I get home and having them tell me all about their day having them help me cook dinner and playing a board game after dinner and the reality is… I'm tired, and the kids are arguing and my husband didn't handle something the way I would have handled it and kindness slips quietly out the back door. The kids love their TV shows and the computer and the video games and I have to cook dinner and do dishes and the laundry is piling up and before you know it – it's time to get ready for bed. I'm thankful that Lynn featured you in her blog – and for the chance to win a copy of your book. 1, 4, and 5. I also have the best intentions for being kind, calm, and loving, but get caught up in emotions when trying to communicate and 75% of the responses are "I don't know." And 4 and 5 because we live in Arizona and it's just so stinkin hot here in the summer and getting outside to do anything is next to impossible, which therefore leads to more media time than is good for any of us!! Thanks for your heart to grow our girls in God's love. Thank you for the chance to win you book. All of these My 13 year old daughter are able to talk about a lot of things together which I truly cherish. Its not every day a mother can say her daughter would come to her with personal issues. I think the limit media is a tough one to work on. thank you again for your encouraging words. My child is not a teen yet, but we are already facing some teen issues with her behavior. I wish I had known when my kids were younger that the issues they had as young kids would be the same issues they would have as teens…just bigger with more consequences. Sometimes as moms, we really don't want to face what we need to…sure wish I had! Keep learning as much as you can while they are young; it will be worth it! Wish I had this book when my kids were younger! I've got two still at home a 16 and 23 year old and one, a 20 year old away at college. I will still work on creating a haven in my home … it's NEVER too late! What a great list – all very real, attainable things. The problem is the balance to actually do those things. I find the media limits to be the hardest and without those the kindness slips away. Thanks for the challenge to keep on trying! laughing hard but not at one's expense. we've gotten into a bad habit of sarcasm – which can be funny but needs to be reigned in a bit in our home. and I truly love your stories that have been told so much they are ridiculously funny! dad and I can laugh at the old times over and over! humor makes a family stronger but it has to be the "right" humor! Limiting the Media is tough for me to enforce and remember, because it's easy yo put on a show while I clean up the house. Encouraging the children to help with the clean up is something that I can try to do more often. My fingers are crossed to win the book! Unfortunately, I have a child that "Letting Kindness Reign" would be the hardest part. I have 3 stepkids, the oldest just left for college, and then a senior and a sophomore, and then the freshman is mine. The sophomore gives us more trouble than the other three combined. We have issues with disrespect, stealing, and lying-the hardest part is she looks you in the eye and tells you she didn't steal something, and then goes to her room to find a better hiding place for the other things she took. Of course, she gets punished, we take things away, give her more chores, but she doesn't think she did anything wrong. She told my husband that "it's not stealing if you intend to give it back". He said "it's stealing if you take something without permission". He said she seemed shocked at this revelation. She has stolen money from everyone in the house, she is sneaky and manipulative. She challenges and tries us at every turn. She's mean to our son with a disability, and manipulates the youngest to do what she wants. I would like our home to be a haven for all of my kids and my husband and I. If the third child doesn't want a haven, well, we still owe it to the other two at home to provide them with one. Welcome hard questions…..b/c it makes me feel inferior to the ability of answering those tough ones. I think the hardest thing for me is to ALWAYS be as kind to my family as I am to the checkout person! That and to really 'be there' when I am talking to them. Thanks! I agree, Cindy. Letting them come to their own conclusions, helping them own their faith, is key. Anonymous, I agree, but it's necessary. Be gusty and turn it off! Lisa, we struggle with that too because we live in Texas where we're having over 2 months of over 100 degree heat. HOT! It's a toss-up between being there and limiting media. As a mom of 4 busy tween- and teen-agers working full-time outside the home, I feel like I never have enough time to be there as much as I'd like to be for each of my children. And for the same reason, I know my children spend far too much time with media, but it is hard to control when I'm not there which is sadly a large percentage of the time. I'd love some good solutions to this problem! Wow, it's heartening to read all your comments. Thank you! I love that you all want to parent well. I can see that you love your kids. I think it would be the first half of #6 (weep and rejoice). I have to remember to step back and see the lesson in the pain to help my nieces and nephews grow in the pain instead of jumping in to 'fix' it. Thanks for the great tips. Limit media is probably hardest right now. It is so easy to be lulled into letting media entertain. It has been hard this summer to make the kids turn off and unplug. We are rapidly closing in on the teenage years, this post was very timely for me! I love her suggestions and know I need to work on undivided attention. I really love the 10 steps and I can see a few places where I really have fallen off the wagon. Another thing that I am passionate about is trying to make sure my home is a Safe Haven for my daughters friends, female and male. They know they can be themselves and act silly or run through the house without getting in trouble. I have a 20 year old who is a kid magnet, they all love being around her and she hugs and loves all over them back but she also uses the "parent" card when she see's one of them being disrespectful to another or doing something that they shouldn't, and the kids are ok with that because they know once she has spoken, they won't hear about it again unless it happens again. The funny thing is when she is around her friends and family she is the silliest most immature 20 year old you can imagine. She loves life, loves being silly and making others happy. I do not desire for her to have children anytime soon, but I really look forward to seeing her have kids and what a wonderful mother she will be. Thank you Lord for my 2 daughters and all of my "adopted kids" as well!! The hardest one I have had to deal with is going outside. I am not an outdoors person and I find myself having a hard time trying to become one. With my oldest turning into a teenager in the next year, I am looking forward to reading more in depth about these steps in your book. Thank you for writing about such an important age. Kindness is tough. I tend to be overly grumpy at times. I feel like a constant referee! This is something God has been dealing with me on for a long time now..I am so excited to see this topic being discussed and the support given to parents for this to be a priority in every home. I am a mother of a senior down to age 8 and a couple in between so the differences they go through at different stages sometimes make this difficult. We have started devotions in our home and that has made the biggest impact on our family. We set aside at least fifteen minutes a day to discuss the Lord and topics they are dealing with..will pray for this book to impact families! I would say Limiting Media. I usually have set rules for TV and Computer, but as a mom with a chronic illness, it's so much easier to say YES when they ask if they can watch TV and I'm in the dark room with a migraine or can't go do fun stuff because I'm recovering from yesterday's excursion. I need to make that time meaningful by reading with them, talking with them, and just being. Great steps…printing this one out to put in my Bible. Patience is a hard thing for me. As not having the right answer to the tough question or not asking a question that will draw them out. Not sure if I answered the question, but there are is so much in each step that I can relate to and also find hard. Thanks for the posts. Being there. Our life gets so crazy sometimes with me working full time. I get focused on my "to do" list and have to make an effort to truly listen and spend time with my kids. Really like the list. I also have trouble with #10, but we have had our times when we all work together to clean up the house and it's been a nice time. It gets done quickly and we worked as a team. My oldest just graduated high school this past spring, and I think we really did a decent job of making home a haven for our kids. I am hoping to continue that for her younger sister and brother. I have 2 the first is limit media and welcoming hard questions. Limiting media is tough especially right now, where the Texas Heat is so unbearable. It's so difficult to go out and do anything right now. I know I should just turn it off and use that time for devotion time instead of right before bed. The other is welcoming hard questions and that's because I'm always doubting myself. Thinking to myself "WHAT IF" I answer the question wrong. Therfore I try not to open that door, but I know that I shouldn't do that because then it will give her the opportunity to go ask someone else. Thank you for the opportunity to win your book. Blessings to you and your family. #1 is the hardest for me…kindness comes easily until I get the least amount stressed. I grew up in a family where yelling was the norm and I'm finding breaking that trend is harder than I thought it would be. Even when disciplining my kids, I want to do it with love and kindness, not frustration and anger. Thanks for the reminder! Limiting media is the toughest. Absolutely. My situation is a little different since I have grown children! I do however have a 5yr old granddaughter whom I worry about. One issue "I" see that bothers me is: The hectic days/schedule my daughter keeps! I wish she would just slow down and spend time with her child at home! Her days are absolutely exhausting! Every single day she has every hour mapped out and something for them to do! If there isn't something planned, she'll find someplace to go! I worry that it doesn't appear being at home just playing together is a priority! If they are home, she's usually cooking/cleaning or on the computer! Now my Grandaughter doesn't like staying at home or not having plans either! In fact if there is a night that Riley isn't "going" somewhere…she'll get upset! She is so use to going all the time that she doesn't understand nor like, just sitting at home and spending special time with mommy and daddy! I have spoken with my daughter about it, but she of course doesn't see what I do and doesn't feel as if her schedule is exhausting… However, SHE IS SO EXHAUSTED lately when I see her that SHE CAN'T STOP YAWNING AND CAN'T HARDLY GET OFF THE COUCH…BUT hey, I'm just the grandmother…I don't know what I'm talking about….I just wish she would slow down and enjoy these sweet and special years with her daughter…she'll never get them back…never! Any advise would be extremely helpful…(that I can do to get her to realize how crazy busy her schedule is, without upsetting her) I am thankful that everything she does, she usually takes Riley w/ her or is family oriented or with our church, but saying NO sometimes wouldn't hurt her! right?? Thanks for your time! Wow, this is good! I think the hardest for me would be #6.